What is Color Change Fluorite? Color change fluorite is a striking gemstone that transitions between vivid shades of blue turquoise or blue-lavender. Or, when viewed under bright natural light this gem appears an intense blue or blue-green. For this reason, it has been called one of the most colorful minerals in the world. Formerly called fluorspar by early miners, the modern name fluorite comes from the Latin "fluo," meaning to flow. Fluorite glows when heated or under ultraviolet light. The phenomenon of fluorescence was named after fluorite in 1852 because of this gemstone's ability to fluoresce. The element fluorine is also named for fluorite and is a major source for the element. Fluorite has a glassy luster and can be both eye clean or visibly included. The value of colored stones is typically determined by a combination of its color, clarity, cut, and carat weight. This is no different when determining what color change fluorite is worth. These guidelines will help you choose color change fluorite stones for your collection. Fluorite is allochromatic; meaning elemental impurities can cause color change. Being known for possessing just about every color of the spectrum, color does not make for the deciding factor while considering the value of color change fluorite. Its color range is affected by impurities in the stone as well as exposure to radiation. Color change fluorite exhibits a turquoise blue akin to the exotic waters of the Caribbean Sea in daylight and shifts to a romantic lavender blue in incandescent light. Most fluorite exhibits a strong fluorescence under UV light. Color change fluorite is categorized as Type II gemstone; meaning the gem is usually eye clean but can also be visibly included. In some included stones it is commonly known to showcase strong color zoning, liquid inclusions, two-phase inclusions and triangular (tetrahedral) negative crystals. Fluorite is known to coin the term fluorescence; a phenomenon and a parameter on which every gemstone is tested. Fluorescence is when a stone is heated or subjected to UV rays and as a results glows. A color change fluorite can be found in common cuts like ovals and rounds and also fancy cuts like cushion, pear and trillions. As it is a relatively soft stone, the cutting becomes a tedious task. Shapes like trillion and pear are avoided to prevent chipped corners. Classic shapes are preferred such as round or oval. Depending on the cut of the gem, Shop LC offers color change fluorite in carat weights ranging from 1 up to 24cts. 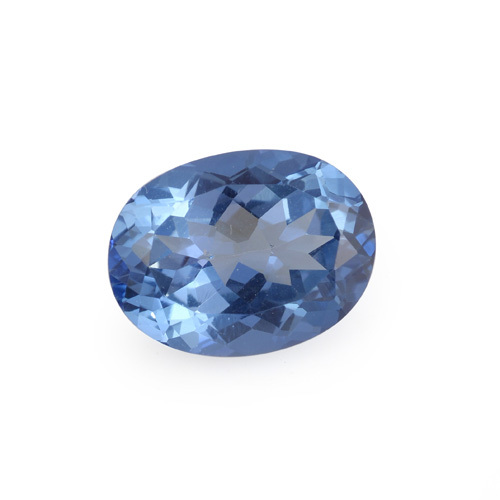 It is more common to find larger sizes and carat weights in oval and pear cut stones. Popular cuts like rounds typically range from 6mm to 14mm and ovals up to 18mm x 13mm in size. Fluorite is an abundant stone and although it takes expert lapidary skills to shape this soft gem, the difference in size only moderately affects the prices. Color Change Fluorite stones commonly undergo irradiation treatment to improve their color. This treatment is stable and permanent with normal care. Color change fluorite is the only gemstone with perfect cleavage (the tendency to break along definite plane surfaces) from all four directions. 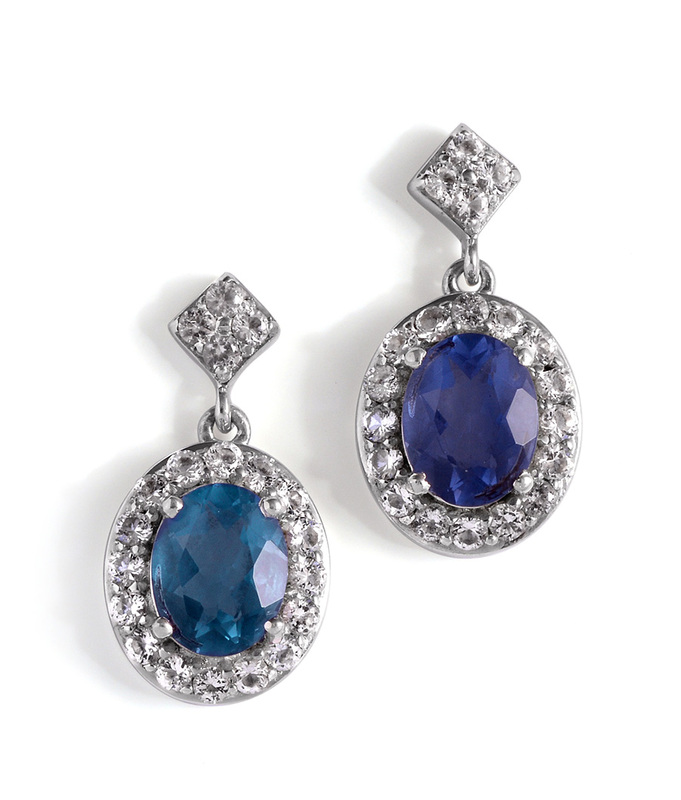 With a Mohs hardness ranking of four, the gem is best worn as earrings and pendants. Avoid wearing fluorite jewelry when engaging in vigorous physical activity such as exercise or sports, or household chores. Color change fluorite is treated with irradiation, but this does not require any extra care. Avoid abrupt temperature changes as it can cause your fluorite stone to fracture. Avoid using ultrasonic cleaners and steamers. Avoid the use of bleach and other harsh chemicals. Use lukewarm water and mild soap for cleaning. Dry with a soft, lint-free cloth. Jewelry featuring color change fluorite should be stored separately and never with other jewelry pieces as the soft surface of fluorite can be easily damaged. Who Can Wear Color Change Fluorite? Want to make a lasting impression throughout the day? Color change fluorite jewelry is sure to help. With its color-changing effect, the gem can help present a chic and elegant appeal from work hours to after-hour office parties! If you are fond of a cool color palette, color change fluorite is sure to delight. 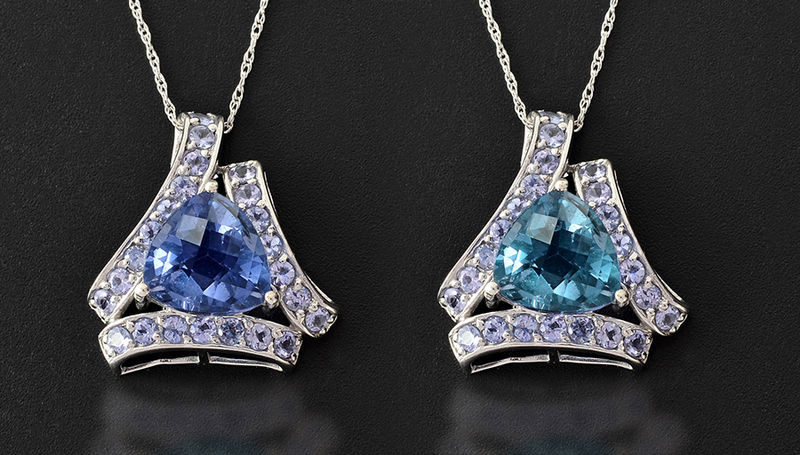 The gem displays a vibrant blue in daylight and a lovely lavender blue in incandescent light. Color change fluorite is worn best with matching blues, whites, creams and pastel pinks. To avoid damage, color change fluorite is mostly worn as earrings or neckpieces. How Does Color Change Fluorite Compare to Other Color Changing Stones? When it comes to the color changing effect, gemstones like alexandrite and garnet definitely come to mind. The main difference is of the hues displayed by these gemstones and that of fluorite. Color change fluorite features cool colors and changes from blue to lavender-blue; blue hues always have a calming effect on its wearer. Color change garnet shifts in browns, purples, oranges and reds. While alexandrite displays a strong color shift from green to red, color change in fluorite is subtler in comparison. The alexandrite effect is the apparent change of color in certain minerals depending on light source. A phenomenon discovered in the 19th century in a chrome bearing chrysoberyl, this effect today can be observed in alexandrite, fluorite, kyanite, spinel and garnet. Where Does Color change fluorite Come From? Many countries are rich in fluorite, including Argentina, Austria, Canada, China, England, France, Germany, Mexico, Morocco, Myanmar, Namibia, Russia, Spain, Switzerland and the United States. However color change fluorite is one of the rarer varieties. Shop LC sources its color change fluorite from China which produces some of the best quality stones in the world. How is Color Change Fluorite Mined? Fluorite is an abundant mineral and is commonly found as a minor constituent of dolostone and limestone. But both occurrences are of little economic interest, as the amount is very low. Fluorite is mined solely from hydrothermal (circulation of hot water in earth’s crust) veins or gangues (the surrounding "host-rock" in which valuable minerals occur), typically found around granite. Mining actually has to follow the veins. Such veins may differ widely in their thickness, so it may be necessary to follow a closed vein for some distance until it reopens. What Does Color Change Fluorite Mean? Fluorite is thought to attract and defuse negative vibes. Known as the "Genius Stone" and "the Stone of Discernment " it is sensitive and responsive to the vibrations of other gemstones and can boost intuition. Fluorite is believed to expand the consciousness and help increase focus and retention of new knowledge. The gem is a valuable source of natural fluoride and in the 18th century, it was taken as a medicine crushed into a powder and mixed with water to relieve the symptoms of kidney disease. The earliest known fluorite crystals date back thousands of years to Ancient Egypt. They often carved fluorite stone into statues, scarabs and vases. Fluorite stone artifacts dating back to 900 BCE through 1650 CE have been unearthed in areas located in Southern Illinois to Western Kentucky, which is known as fluorspar region. Is Color Change Fluorite a Birthstone? Color change fluorite is not a traditional or modern birthstone. Fluorite is also associated with the Pisces zodiac sign. 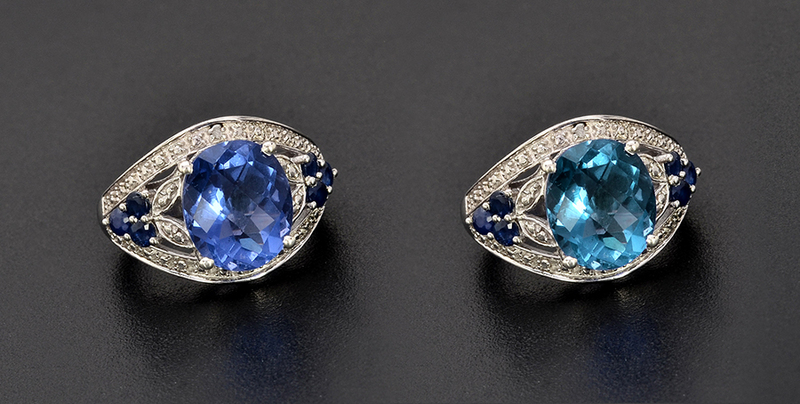 Due to its enchanting blue hues, the gem can also be worn as an affordable substitute to blue topaz and tanzanite, both modern birthstones of December. Ranks four on the Mohs hardness scale. Color Change Fluorite displays blue turquoise or blue-lavender transitioning to intense blue or blue-green. Color change fluorite goes through irradiation for color improvement.